It's Monday and I feel like I'm recovering from a holiday hangover. So much food. And then more food on top of that. Let's not forget the sweets. Oh, the sweets. And then a little more food. Scratch that...A LOT more food. And some more sweets. Did I mention food?! Of course, there was celebrating, too. Fellowship...family...friends. All around just the perfect little weekend with my most favorite people. 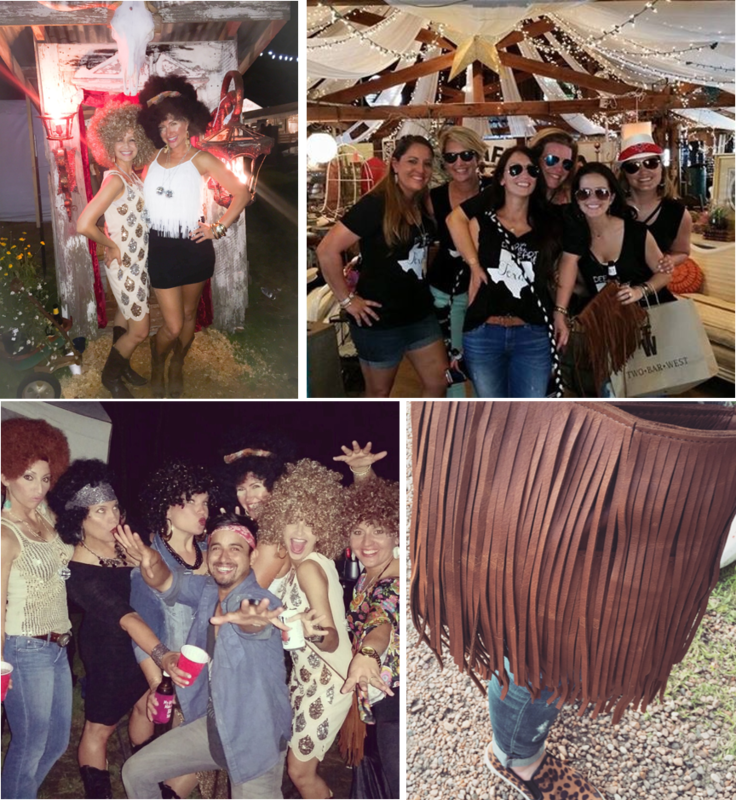 It was also Texas Antiques Week and I headed to Round Top with the girls for a little shopping and some prom fun. It's only a couple of hours away, but we stayed the night so that we didn't have to rush back. I had to call Mr. Spouse and ask for forgiveness when I bought my favorite new purse. I mean, it's easier to ask for forgiveness than permission, right?! I sent him a picture of my fringe beauty and he asked if I had to kill Snuffleupagus to get it. He wasn't impressed. The boys were up before the sun on Easter morning which was perfect for the purpose of getting ready for the early service at church. 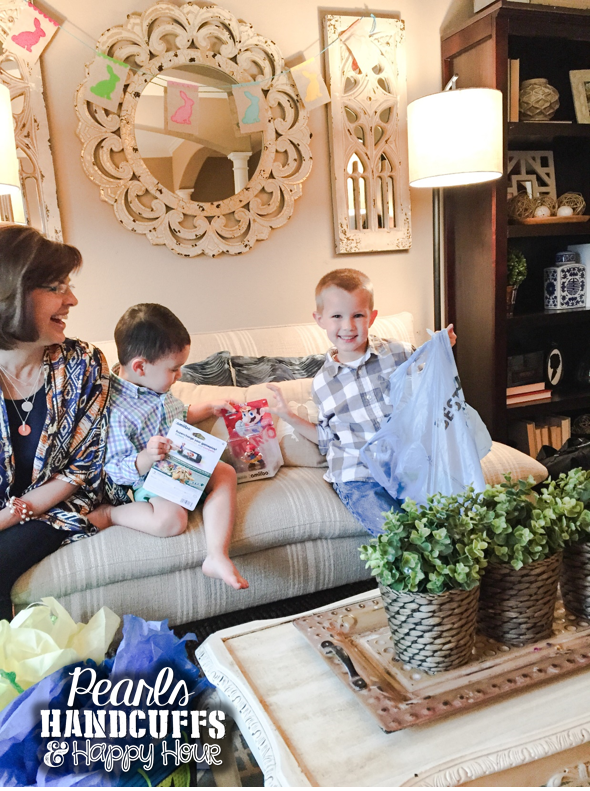 They woke us up before scoping out their Easter goodies and picking the lollipops from their jellybean garden. We hosted Easter this year and had quite a little...err, BIG...crowd. The more the merrier. We brought in some extra tables and chairs so that everyone would have a place to eat. 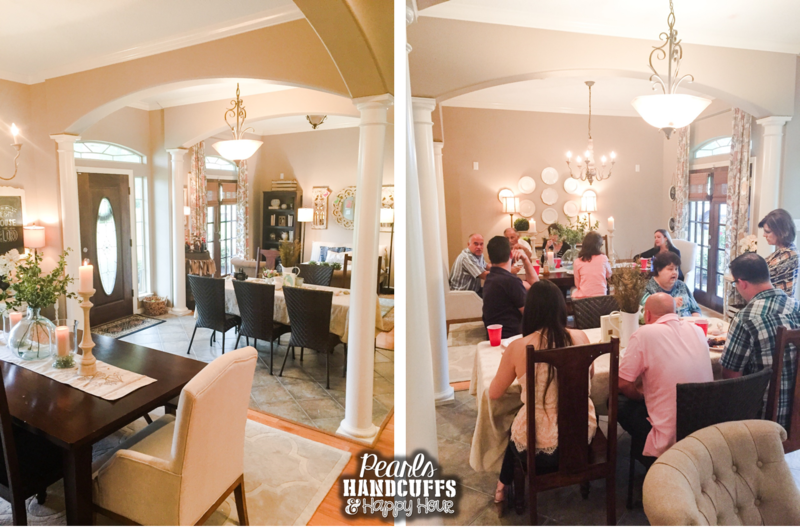 I have to say that I really do love our little house...it's got the perfect floor plan for entertaining! These are just a couple of the tables at the front of the house. We also had some in the kitchen and outside. I found these cute little eggs at Marshall's and had to have them, but had NO clue what I was going to do with them. I decided to make little party favors for the ladies and use the eggs as gift wrap. 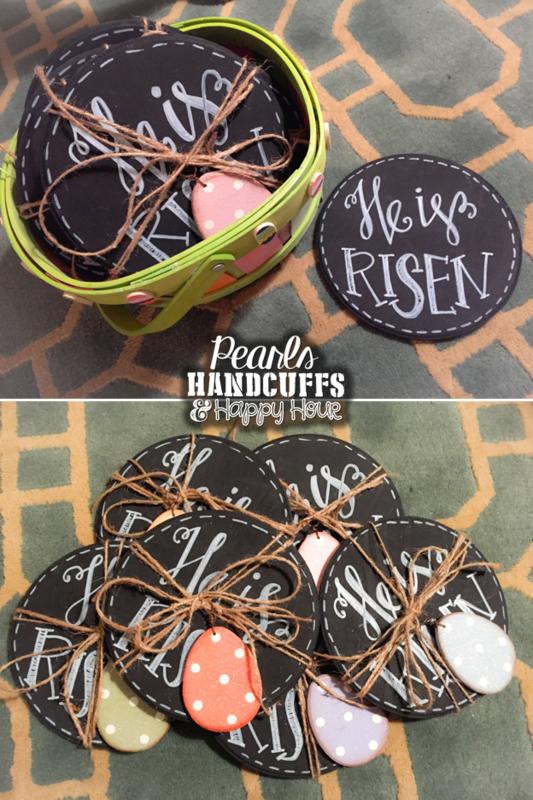 I just painted the wood circles black and used a white paint pen to write the words. 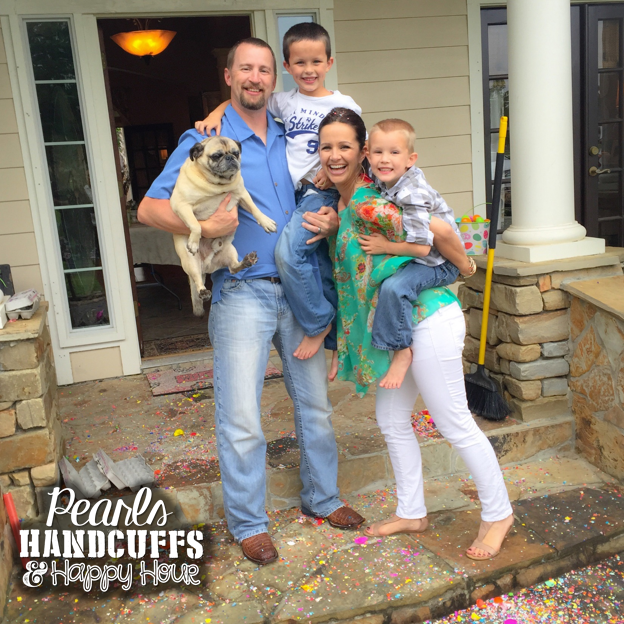 No Easter is complete without our traditional family confetti egg fight. 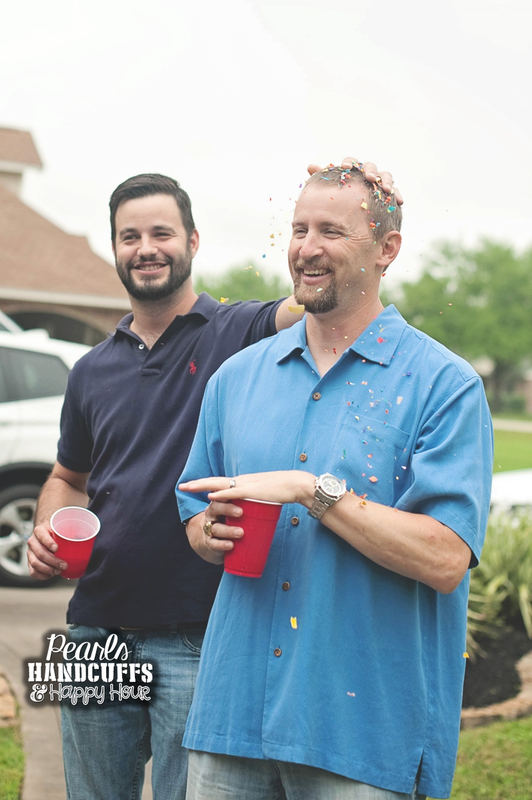 Between my brother and I, we had a little over 20 dozen confetti eggs! It was a MESS!!!! 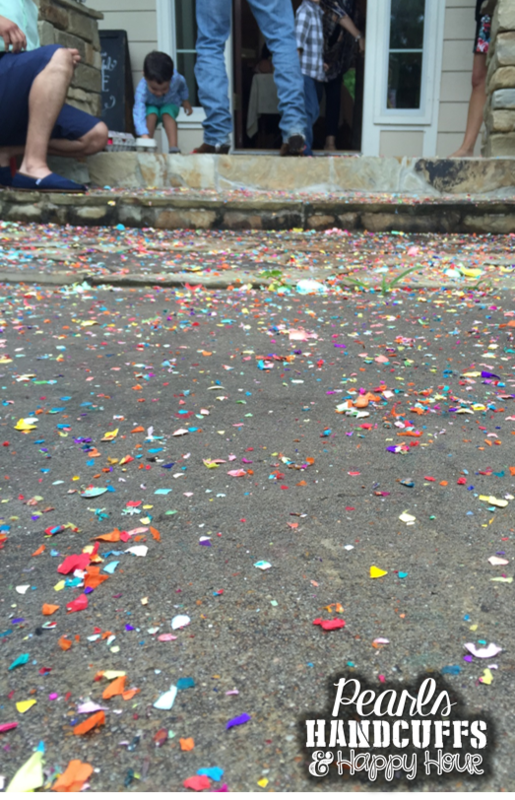 I'm still trying to get the confetti out of my hair! HA! I LOVE this pic...this is what kicked off the crackin' this year. 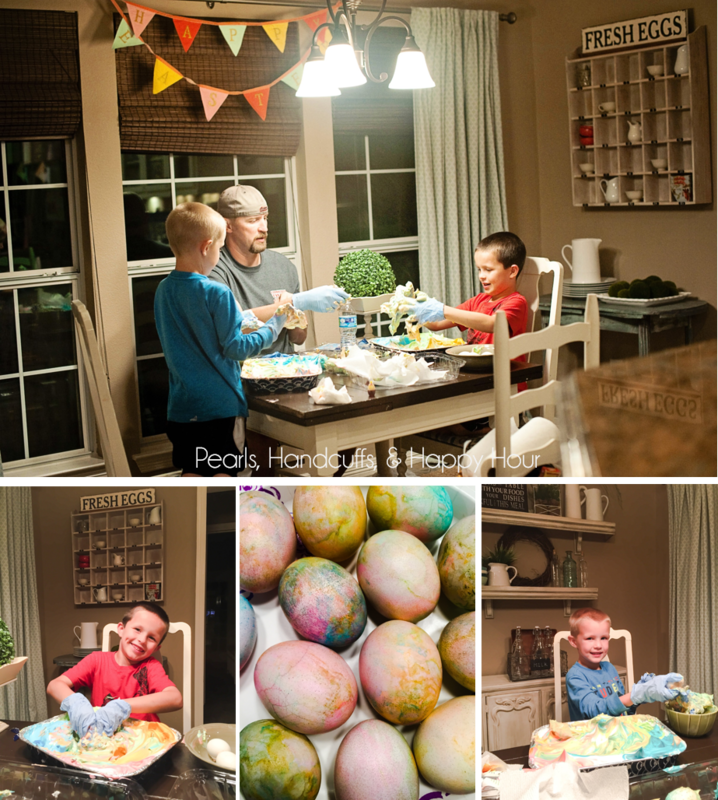 The kids hunted for Easter eggs...their favorite part of the celebration. 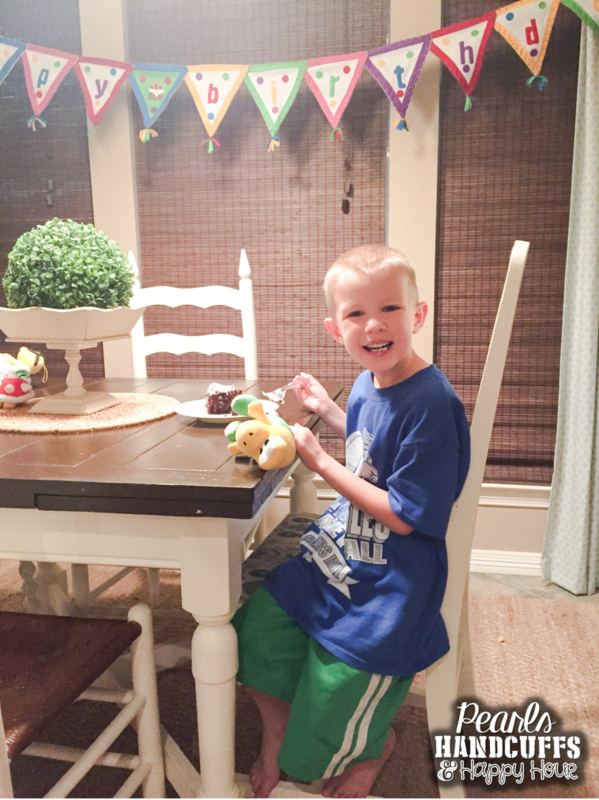 And this precious love celebrated his birthday. Speaking of birthdays, my baby turns 6 today!!! What better way than to celebrate another year than with a slice of cake for breakfast?! Yes, please!!! Remember when I was talking about all that FOOD earlier?! This *might* have ben the star of the show. This simple and savory pot roast. W.e had tons of meat from which to choose...ham, pork, chicken, sausage...but THIS pot roast. Well..it was the best. Hands down. We served it with dinner rolls so our guests could make little sandwiches if they were so inclined. AMAZING. We have leftovers and plan on repurposing the roast in several different meals. I'll have to report back on Friday to let you know what we did with it! In the meantime, you definitely need to try this for yourself!!!! You won't be disappointed! Combine the slow cookier pot roast seasoning with 1 cup of water and mix until combined. Place your roast in your slow cooker and pour the pot roast seasoning /water mixture on top. Now pop open a can of coke and pour that right on top, too. Yes, the WHOLE thing. Cook on low for 8 hours of high for 4. I personally prefer the slow method :) When the roast is ready, shred it all up inside the slow cooker and then pour the packet of Au Jus on top and mix well. Serve and enjoy!!! 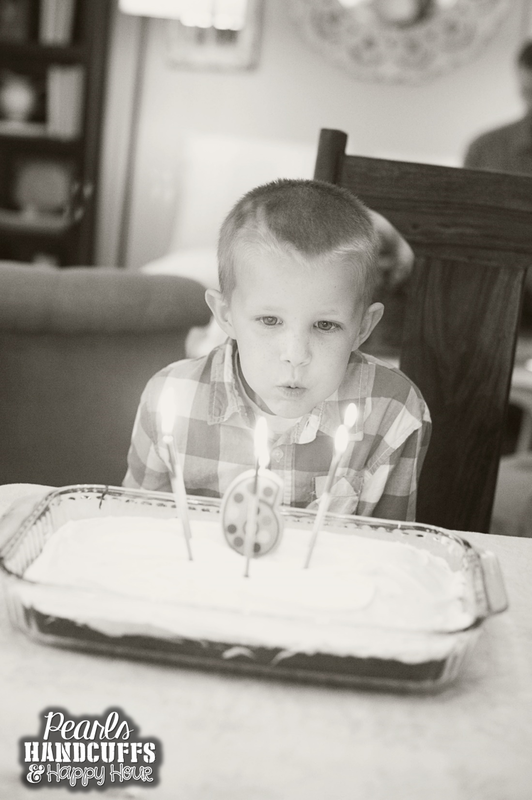 I love that there are still moms that bake birthday cakes rather than buying them from the bakery. My mom always made us the boxed cake mixes and it bring back sooooo many good memories. SOOOOO many good memories for me, too!! My cakes were ALWAYS homemade!! I bought a few of the boy's cakes when they were younger...and they were wonderful...but there's just something about a homemade cake that can't be compared! And my boys prefer the taste, too!! Bonus!!! Your husband is a smart man...covering the drink like a pro, so the confetti didn't get in his drink. Love it! Hahahaha!!!!! I LOVE IT!!!!! I bought the top at a little boutique in Round Top this past week...only $16!!!!! I LOVE IT!!! I need to see if I can find the receipt because I can't remember the name of the boutique. I'm hoping they sell online because they had some CUTE stuff at really reasonable prices!!!! Details on your sandals please? Love them! Love your blog! And I was in Round Top this weekend too. It's my favorite thing ever! You are so sweet!! Thank you!!! And I TOTALLY AGREE about Round Top...it's the best thing EVER!!!! SO much fun...and shopping!!!! Where is your birthday banner from? Hey Jodi! I bought it at Hobby Lobby in the party section about 7 years ago, but they might still carry them!!! It's held up so well!!! Oh I just loved this post! Your family looks like so much fun! And the Round Top event??? Whyyyy aren't there fun things like that in Ohio!?? 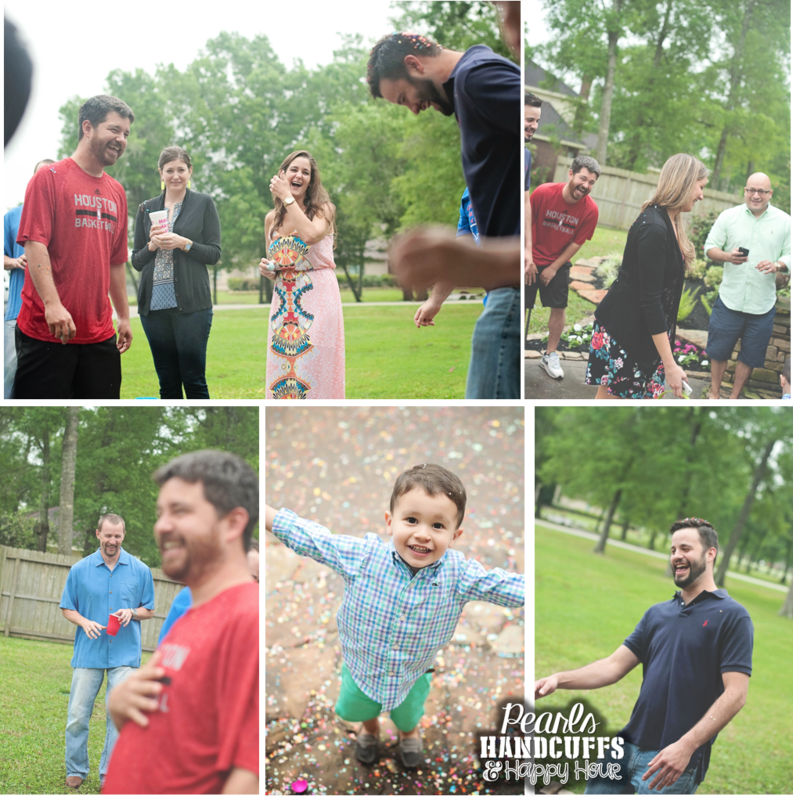 Love love the confetti eggs and birthday celebration too- happy birthday to your baby! Definitely trying the pot roast recipe...made your meatloaf last week and it was a huge hit!! Trying this pot roast tonight! 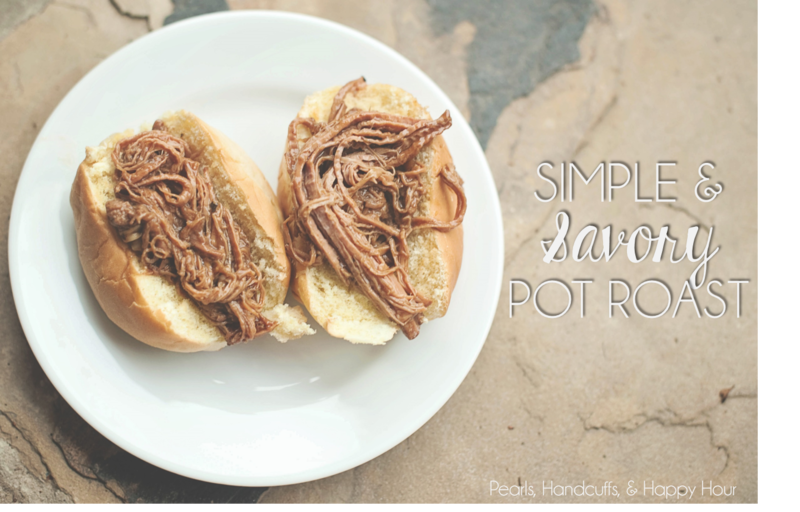 My hubby generally dislikes pot roast...but I can't keep him out of the slow cooker! I've made another pot roast recipe where it said to mix in an au jus packet at the end and I found it to be really salty. Is this one salty?